See this comparison of Egress Email Encryption vs Stay Private Email Encryption. Enterprise level email encryption with multiple encryption options. SMBs and Non-Profits who require a simple to install and low cost email encryption service. What is Egress Email Encryption? Egress is a corporate email encryption solution. It aims to provide flexible, easy to use email protection, with the highest levels of security. It offers both secure web portal and PDF type encryption tools. As a service aimed at large organisations primarily, Egress Encryption is fully government and industry certified. They offer a large amount of customisable policies and user controls. Egress Email Encryption is a strong email encryption platform for large organizations looking for a way to secure send emails. It offers multiple email encryption options, including end to end encryption within outlook, secure web portal encryption and secure PDF Encryption. It’s easy to use for end users and offers a range of controls from within the existing email client, including the ability to for end users to manually encrypt email and block copying and pasting. This can greatly improve the email security of an organisation. The platform offers a range of admin policies and controls and full auditing, so admins can track where data is leaving the organizations. The platform is aimed at enterprise level companies and so is a high cost service with advanced features. For large businesses looking for strong security, auditing and real time user controls, Egress Email Encryption is a strong solution. 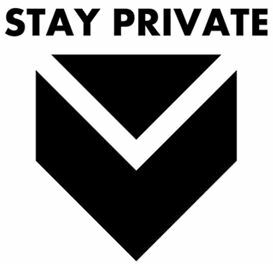 Stay Private offer simple and secure file sharing and email encryption. Small and medium sized businesses looking for easy to use and secure email encryption. Organizations looking for email encryption as part of an email security platform. Stay Private is a British company offering a comprehensive email encryption service. The service as a focus on being easy to install and packed with features. It offers attachment encryption, electronic signatures and delegation functionality alongside an extremely secure email encryption service. The encryption service works in two ways, through end to end encryption and through secure web portals. StayPrivate is a good option for keeping emails secure and protected. With multiple encryption options your confidential emails are guaranteed to stay safe. The deployment process is easy for administrators to install and configure, with multiple policies to ensure the service is right for your organisation. The service is also easy for end users, working within existing email apps. The user interface for receiving and replying to encrypted emails is easy to navigate, and users only need to create one four digit passcode which they can then use to access all encrypted emails sent to them. There are controls to revoke access to encrypted emails, but there are not as fully featured as some competitors service. However, StayPrivate is more fully featured in other areas, such as having auditing, instant messaging and file encryption and delegation functionality. They also offer great features for larger companies including bespoke encryption options, encrypted video calling and advanced audit features. Offering multiple encryption options, customisable policies, a streamlined user experience and auditing, StayPrivate is a good all round encryption solution which Expert Insights would recommend.